These Soft & Chewy Molasses Cookies are a year-round classic that deserve special attention at Christmas time. 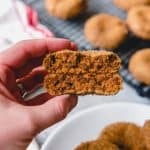 Mildly spiced, richly flavored from the molasses and brown sugar, and generously sprinkled with granulated sugar for a touch of sparkle, this classic molasses cookie recipe belongs in your dessert arsenal. In the large bowl of a stand mixer, beat the butter on medium-high speed for 1 minute until creamy. Add the brown sugar and beat until light and fluffy. Add the molasses, egg, and vanilla and beat well, scraping the sides of the bowl. Whisk the flour, baking soda, ginger, cinnamon and salt together in a bowl, then add to the butter and molasses mixture on low speed, mixing until combined. Cover the dough with plastic wrap and chill for at least 1 hour, or up to 3 days. Preheat oven to 350 degrees F. Roll the dough into balls, about 1 1/2-inch in diameter, then roll in the extra sugar and place on a parchment-lined baking sheet. Bake for 10-12 minutes, just until the cookies begin to crack slightly on top. Remove from oven and cool completely on wire racks. Sprinkle with additional granulated sugar for extra sparkle, if desired. Adapted from the back of the Grandma's molasses bottle.